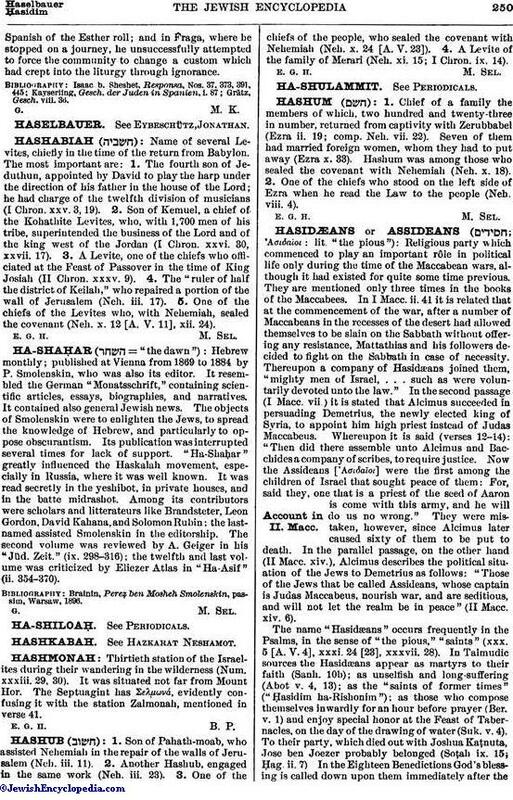 Hebrew monthly; published at Vienna from 1869 to 1884 by P. Smolenskin, who was also its editor. It resembled the German "Monatsschrift," containing scientific articles, essays, biographies, and narratives. It contained also general Jewish news. The objects of Smolenskin were to enlighten the Jews, to spread the knowledge of Hebrew, and particularly to oppose obscurantism. Its publication was interrupted several times for lack of support. "Ha-Shaḥar" greatly influenced the Haskalah movement, especially in Russia, where it was well known. It was read secretly in the yeshibot, in private houses, and in the batte midrashot. Among its contributors were scholars and litterateurs like Brandsteter, Leon Gordon, David Kahana, and Solomon Rubin; the last-named assisted Smolenskin in the editorship. The second volume was reviewed by A. Geiger in his "Jüd. Zeit." (ix. 298-316); the twelfth and last volume was criticized by Eliezer Atlas in "Ha-Asif" (ii. 354-370). Brainin, Pereẓ ben Mosheh Smolenskin, passim, Warsaw, 1896.